Incredible Upper Michigan rental cabins situated on beautiful South Manistique Lake.Sand and Stars Resort and Motel of Curtis Michigan. The Sand and Stars Cabin #6 has 2 great bedrooms. 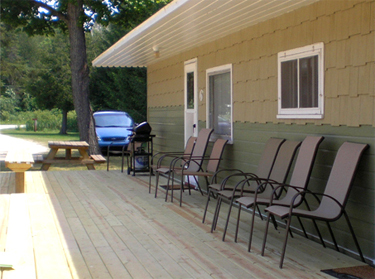 Our clean and comfortable Upper Michigan rental cabins come with WiFi, cable television, complete kitchens, full bathrooms and an outdoor grill. 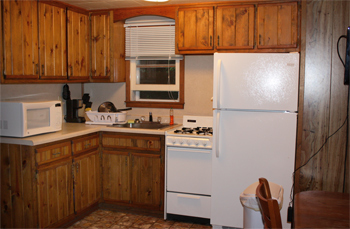 It also has beautiful new furnishings and flooring.Linens and bedding are provided. Please bring your own towels and paper products. Sorry or smoking inside of accomodations. See more photos of Cabin #6 along the lake - click here. Your stay along the lake will be filled with breath taking views and water filled fun! With a shallow swimming area and playground, safe entertainment is just a step away.